There are millions of events every single day and here it SHARP we find it really difficult to know what’s actually worth our precious time. So we’re on a mission, we’re here to give you the facts, the ‘eureka!’ moments and let you know exactly what we learn from the stand-out events we attend. So next time when that eventbrite alert comes through, you’ll know exactly what to do. 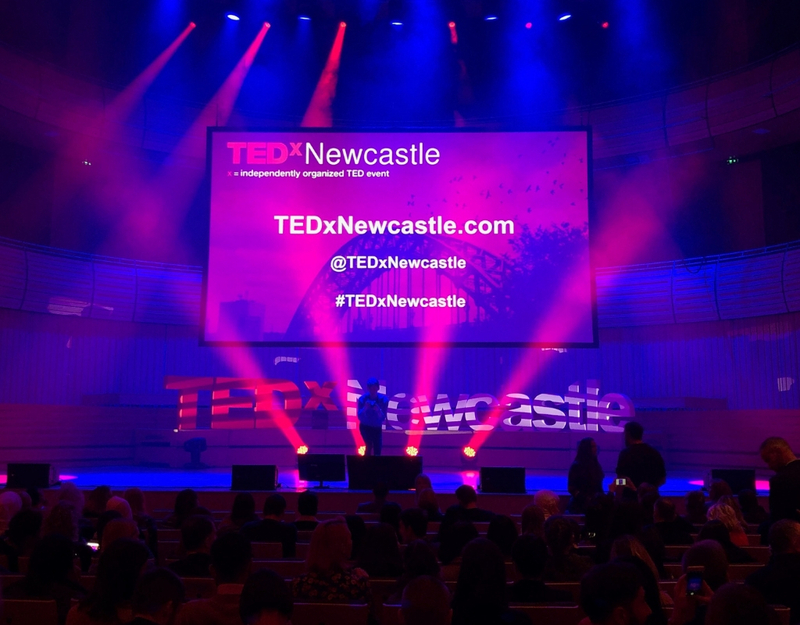 TEDX Newcastle is one we’ve been looking forward to for a while, with an excellent panel of speakers lined up, some brilliant musical entertainment and an amazing venue in the Sage Gateshead, here’s the list of our favourite speakers, our highlights and what we found out. Alfie Joey lived in a religious order for 15 years, who knew?! He’s changed and adapted his career dependant on what he wanted to do to achieve his dreams, including training to be a catholic priest, teaching drama, becoming a comedian, hosting the BBC Newcastle breakfast show and also displaying his cartoonist work in two art galleries. Changing careers and following your dreams is crucial. Make sure to use the support network around you and go for it. “We interviewed three generations of Liverpool gangsters, the first grew up and got into organised crime in the 1970’s, then got into the heroin explosion in the 1980’s, he was the right hand man of Curtis Warren, the first gangster that got on the Sunday Times Rich List. The second one we interviewed got into organised crime in the 1990’s, he got into it in the 90’s dance music boom when the door staff became gangsters. The third generation was a 16 year old that had escaped county lines drug dealing. County lines drug dealing is when children are exploited to transport and sell heroin between one city and another. Perhaps the most important question we asked was, as a young gangster how easy would it be for you to get a gun? We need to start looking at national crime problems differently. Heroin-use is getting worse, from 1,000 registered users back in the 1970’s to 350,000 users today. We need to pay much more attention to what we’re putting into our body and how it affects our gut microbes. Microbes transform the way they work dependant on what your body goes through. Eg. if you’re pregnant there’s no need to eat for two, your microbes change the way you store food. Microbes choose the amount of energy to store as fat in your body. Antibiotics work against gut microbes and can affect our weight. What you feed your microbes does matter, by eating fibre rich foods, these travel straight to our large intestine and to your gut microbes allowing them to release their positive chemicals that can regulate weight gain and make you happier. You need to go at someone with a dry hand and match their grip when shaking hands. Always make sure to accept and say thank you for a compliment, even if you feel a bit awkward. If you need to check how your breath smells, lick the inside of your wrist, wave it round a bit and smell it. Newcastle University’s Professor and Principal Investigator of Educational Technology. Winner of the Million-dollar TED Prize in 2013. In one of Sugatra’s first experiments he placed a computer in New Delhi and studied how children taught themselves how to surf the web without a teacher. The absence of a teacher can assist learning. But also positive encouragement can accelerate this and encourage children to learn. Sugatra developed the School in the Cloud combining self-organised learning and the positive encouragement grandmother effect everywhere from India and Harlem to Killingworth. If you allow children to safely search on the internet their reading and comprehension goes up dramatically as they improve their searching skills. Sugatra proposes the internet should be introduced as a formal subject at school and also during examinations. It’s a subject that all of our children are going to need and will depend upon in future when they come across things they don’t know. You must get a good relationship with the circadian rhythm. Have a google, up until the electric light bulb human’s slept from short phases more often rather than overnight. It’s important and will make it much easier for you if you’re a night owl, to learn the importance of 90-minute periods and to wake at the end of a 90-minute period when you’re coming out of a deep sleep. A consistent wake time is also important, that way you can make conscious decisions about what time you’re going to wake up and plan accordingly to your 90-minute period. Your body’s recovery programme starts from the minute you wake up. You can fall asleep anywhere, anytime. Lying in the foetal position is one of the most comfortable for recovery. Stephen has operated on over 11,000 patients becoming one of the world’s top heart surgeons. His work is ultimately pioneering as he described the process of trying to eliminate heart transplants through the use of technology, now creating cardiac pumps that can ultimately increase life-span and have a much higher survival rate. An extremely inspirational man. If this man was your chemistry teacher, you would definitely pay attention. This man had the audience in the palm of his hand as he talked through his different experiments at full speed, causing explosions, bangs and enough fire to send the health and safety officer at the Sage on sick leave. Just ‘wow’ this was TEDX’s first musical performance of the day and they did not disappoint. The room was instantly filled with the infectious energy of Hannabiell Sanders and Yilis del Carmen Suriel along with the sounds of their trance drum rhythms. It was pretty hard not to leap out of your seat and join in. The final performance of the day and an absolutely brilliant walk-through chords used in music and why some of us have complete left feet. We absolutely loved the #Instabae song she finished with. Great to hear from Olivia Remes about anxiety disorders and in particular loneliness and how to beat it. After listening, we’re going to be having a lot more chats when we’re out and about. The event was hosted by the brilliant Herb Kim, who also gave the heads up that there may be another TEDX event next year. Fingers crossed for 2019!